Many days in life pass without distinction, a handful of others stay with you for good, not just as a static memory but as a turning point in your personal perspective. 20 years ago today was such a day in my life. 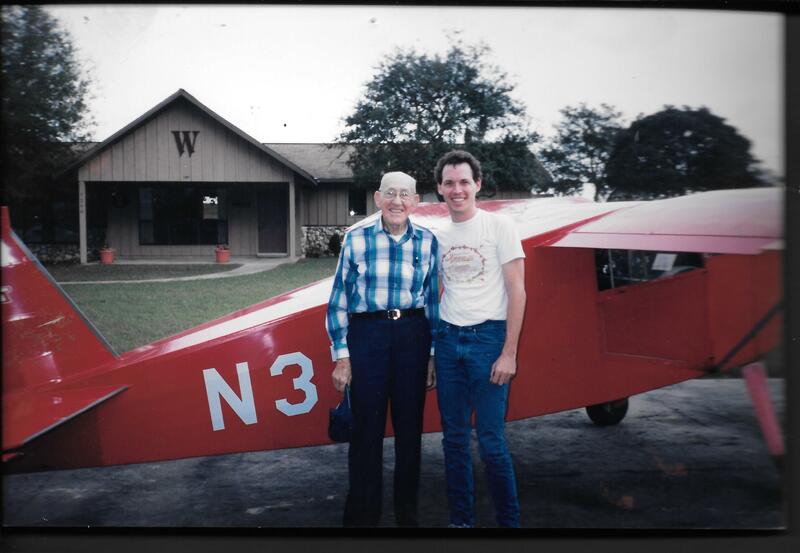 Above, 12/11/94, I stand next Steve Wittman, after flying with him in his Olds V-8 powered Tailwind, N37SW. Today this plane hangs in the terminal of Oshkosh airport which is named in Wittman’s honor. There was a tradition at Embry-Riddle that senior engineering students were invited over to Leeward Air Ranch in Ocala FL after the semester was over, for a long social day. One of the professors was married into the Leeward family, and it was always an exceptional event. Although I had already graduated, I knew the instructor and asked to come along. Out of the group of students, I was the only person who knew what the large “W” over Judy Leeward’s neighbors door stood for. I looked over into his hangar, and Steve’s wife Paula came out, invited me to wander through their hangar which had the Old’s Tailwind, The O to O special and the V-Witt in it. She said Steve would be back shortly, and he would be glad to take me flying. I was stunned. While waiting for his return, I mentioned this to Judy Leeward, who assured me that if Paula said it was good, it would not be an intrusion into their day. We went flying for just 25 minutes. It started with a brief efficiency demonstration that the plane could do 125 mph at 2,500 rpm and 18″ of manifold pressure, the same power setting it took to taxi in 6″ of wet grass. This lead to 195 mph flybys on the deck and a long series of very smooth positive G aerobatic maneuvers. It would have been a skilled display for any pilot, far less one who was 91 years old. After landing we spoke about the modifications to the 215 Olds, an engine I knew pretty well. There were a few photos, including the one above. A moment after it was taken, Steve looked at me and said with some disgust “You are wearing a Monocoupe shirt” He didn’t say anything else about it, as if disliking Monocoupes as the most natural thing any aviator would do. When I got home I wrote him a brief thank you note and mailed it the next day. A few months alter I saw Steve and Paula at their forum at Sun n Fun. She recognized me an said that the note was unexpected and made her and Steve feel appreciated. Two weeks later they both perished in the crash of the O to O special on their way back north to their summer home, Oshkosh. I have carried forward the lesson that most of the good things that have happened in my life in aviation took place because I showed up for them. The aviators I have known have almost always showed themselves to be very kind and generous people. They will gladly share what they know and have experienced with anyone who is genuinely interested, but you have to be there. The sole important difference between myself and my roommates who didn’t go flying with Steve that day was I got in the car and drove 100 miles to be there, and they didn’t. You can spend a lot of time looking at magazines and websites, lamenting the expense and difficulty of engaging in aviation, or you can decide that in 2015 you will not lose an opportunity to have your own event in aviation, one that you will remember 20 years later.-ww. “If you look at their lives close enough, all of the greats offer something to guide us in pursuit of the timeless truth of flying. Pietenpol teaches that we are more likely to find it in the simplest of planes; Lindbergh knew that you started your search inside yourself; Gann said that we will not see the truth directly, but you can watch it at work in the actions of airmen; and Wittman showed that if you flew fast enough, for long enough, you just might catch it. These men, and many others, spent the better part of their lives looking for this very illusive ghost. Some of them paid a high price, but you get the impression they all thought it was worth it. ” – from our Oshkosh 2008 coverage, -ww. William, I’m jealous that you got to fly with Steve, but I’m glad that you took us along. The efficiency of Steve’s designs was such that he was competitive with people who spent many times the money he did to race. He did a lot with a little, and it’s a measure of his abilities that Tailwinds are known for their efficiency even today, over half a century later. William, I am new to your site but I have to tell you that you are spot on with your philosophy, insight and intuition. Stay your course, rewards are many.